Whether you’re going out of town for business or pleasure, traveling can often be a demanding experience. But if you’re a pet owner, travel brings an additional headache: what to do with your beloved dog or cat? While there are boarding facilities available in most cities and towns, you may not feel comfortable leaving your fur baby at a kennel. Being caged in a large room with other animals can stress out even the most relaxed of pets, and there is always a risk of illness or disease when a group of animals is kept in close quarters. In an ideal world, your dog or cat could stay at home, maintaining their diet and exercise schedule — while not being frazzled by your absence. For pet parents who are unable or unwilling to board their pets, there are more choices now than ever before. 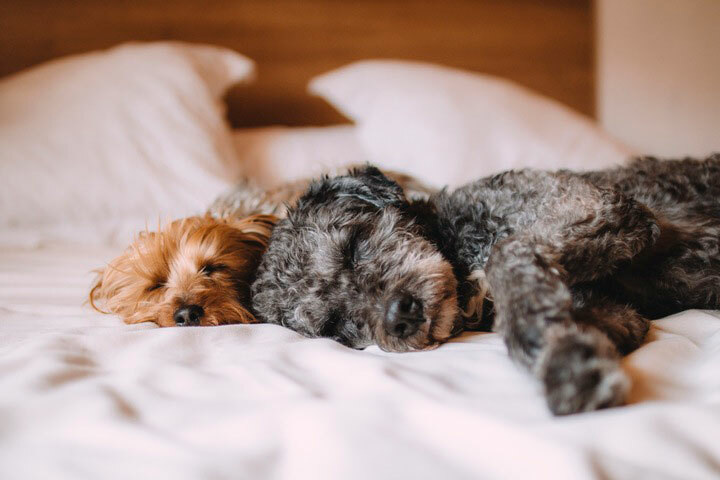 Read on to learn about some great options for overnight pet care that will meet your pet’s needs — and ease your worries about their well-being. If your dog or cat is relatively low maintenance, a few visits each day may be the key to keeping Fido or Fluffy happy and healthy while you’re away. A pet sitter will stop by your house at least one time per day to take your dog for a walk, feed your dog or cat, and do minor household tasks like bringing in the paper and watering plants. It’s a relatively low-cost way to make sure that your pet’s needs are met while you’re away. Most pets with working owners are used to being home on their own for relatively long stretches of time. A vacation visit service will be similar to their daily routine, with at least one visit per day for cats and three for dogs. They’ll get food, exercise, and medication along with stimulation and affection. They won’t be stressed out by the hectic environment of a kennel. This choice is great for shorter trips, but may not be sufficient for pets whose owners who are planning to be away for a week or longer. Another great possibility for pet care while you’re on vacation is an overnight pet sitting service. Many pet care businesses will send a staff member directly to your house for a set length of time (up to 12 hours). While there, the sitter will play with your pet, take him for walks, feed and water them, give them necessary medication, and clean up after them, including changing a litter box or cage pad, as needed. The sitter will typically arrive in the evening and spend the night, walking your dog or playing with your cat before leaving again in the morning. The benefits of such an option are clear: your pet gets love and affection in the comfort of your own home. He won’t be exposed to other animals who may be carrying an illness, and won’t risk an injury from an overly aggressive animal at the kennel. This is a particularly good alternative for high-strung dogs or cats who simply would not be able to tolerate the loud, chaotic environment of a kennel, or pets who do not get along with other animals. Your pet will receive excellent care and have companionship while you are gone, making this the perfect selection for any pet owner who will be gone for a longer length of time (a week or more). Like a bed and breakfast for humans, bed and biscuit services involve staying overnight in somebody’s home. If your dog will not do well on their own, even for a night, a bed and biscuit may be the way to go. This service is relatively straightforward: dogs can stay overnight in the home of a pet sitter for up to 24 hours. They’ll get multiple walks each day and a comfortable bed to sleep in, along with food and water. They’ll be showered with affection and attention, and will avoid the issues that often come with boarding in a kennel. Your pet will be treated like a member of the family, and kept on a similar schedule as to what you do at home. Of course, there are limits when choosing the bed and biscuit option: your dog has to be well-behaved, up to dates on shots, free of fleas and ticks and house-trained. A friendly, social dog is the ideal candidate for this type of pet sitting service. If a kennel is not an option for your beloved fur baby, consider these great alternatives to the traditional kennel service. They’ll keep your dog or cat healthy and happy, and make it much easier to plan your vacation or business travel! Contact Paw Pals today to learn more about overnight pet sitting, including special options for cat sitting.